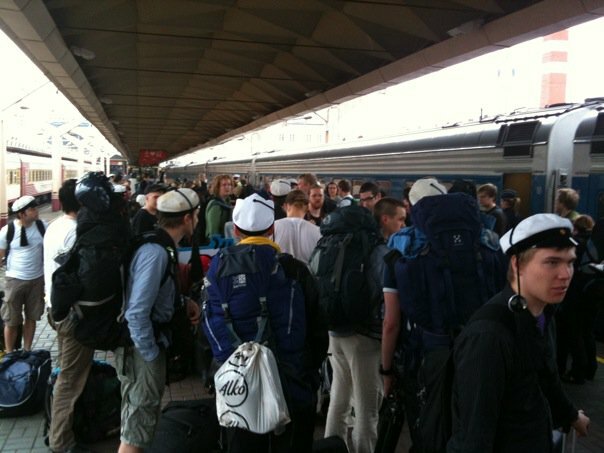 Aalto on Tracks is taking around 100 people from the Aalto University community with a private train from Helsinki to Shanghai World Expo, China, on May 2010. That's over 10 000 kilometers and a week on tracks! Our goals are to take Aalto University, Finland and Finnish education to the world. We want to unite Aalto people and create an unforgettable learning experience for around a hundred Aalto people and guests. Follow us on the map and via Talky! Yesterday we started with the Espoo case study. Approximately 30 people were developing ideas about the service concepts and the online services of the city of Espoo as well as discussing how to improve the city’s employer image in the eyes of students and young professionals. Several ideas popped up during the case workshop. How about if Espoo had an online service for group commuting? “Kimppakyyti” could ease traffic jams as well as make the city greener. Another idea was that Espoo would announce a competition where anyone could suggest their dream job in the city’s employment. The winner would of course win this unique and personalized job opportunity! These were just a few of the thoughts from the first workshop and tomorrow we will meet up again and continue the fruitful discussions. 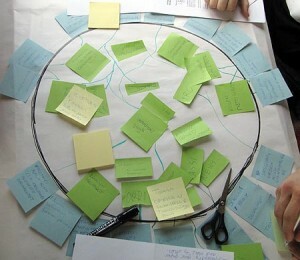 There has already been two Aalto communications workshops – with the third one coming up tomorrow. The focus has been on how to develop communications related to studies and how to make students feel part of the Aalto community. In the first workshop we discussed about contents and channels of current student communications and how they could be developed. Creating a student service where Oodi and Noppa could be in one was proposed as well as a better tool for planning studies. In the second workshop we developed creative ideas about “what is your dream-come-true way of getting and sharing information about/with the Aalto community. Social media had a strong role in these wonderful sketches. Ideas collected on Tracks will be used back home to develop student communications and the new student intranet. If you wish to comment on these issues, please write an email to hanna.p.korhonen@aaltouniversity.fi. Privjet! The Act On Tracks session was an improvisational theatre lesson. We started last night (Sunday) in the restaurant car. The first games and plays were all about listening to each other, pushing ourselves to let go of norms, and letting our imaginations flow as freely as possible. I directed the session, but really, the participants did all the hard work. After all, it is the actors who make the stories spring to life! The duration of the session was 90 minutes, and we had 8 actors performing. People found the action fun, and requested for more lessons afterwards. Unfortunately, we haven’t got much space in the train, so no extraordinary parkour moves could be integrated into the play. The group was pleasingly small, and we had the most fun with the basics of improv acting. We saw three scenes, multiple games, and loads of funny and great situation comedy. The Improv is powered by the imagination of the human mind, thus, we visited places like the Himalayas, Stockholm City, old folks home, blueberry fields of Siberia, and much more during the session without leaving the train. The most unforgettable rule was: to say ‘yes’ to everything that others propose. It is always interesting to see how some situations that never can happen in real life, jump to life when there is no option to opt out or say no. We are on the private train! Moscow is now back from us! We hopped into our private train in Kazan train station. Placement for the people was already done beforehand and we could just put our stuff in to cabins and have first lunch 2 pm. The food on the train is very delicious. There is two starters, main course, desert and tea served every time on lunch and dinner. We had first meeting with the train staff and restaurant car personnel in the beginning of the trip. The staff were very polite and helpful. It is somehow very suprising to get smile and helpful hand always when you were setting up something. I mean, this is not very normal in Russia. You can also be pretty relaxed as there is no scare of getting things stolen. After lunch, first program was the introduction to each other – get to know moment. We have photobook printed out of every participant for everybody. We also set up “manual Facebook” on the train – participants’ photos are printed on the wall of one corridor and you can post a comment by adding a post-it paper under them! Morning meetings and some of the workshops are organized in the conference car. Atso and Hanna from the publication and communication team also instructed people to start working on the articles and preparations for the magazine. During the evening Markus and Oona kick-started Aalto University Campus workshop – There was preparations and planning material presented to participants of the current state of campus work in the university. Task was to sketch solution for the map, scenery and basic arguments for Aalto campus. Winning team will be chosen on Wednesday by voting after they have presented their solutions. Material will be provided to Aalto University directors and the winning team present their solution to Aalto University vice-rector Jorma Kyyrä, who is in responsible for infrastructure of the university. Kalevi is preparing Design Emotions workshop for tomorrow. The clock is around 23:00 at the moment of writing this blog entry. Around half of the people are watching Russian movie Admiral in the conference car and some smaller group is playing banjo drums, guitar and singing Mamba in the cabin next to me. There is different kind of program going on when you just walk by the cabins and have a look inside. It’s good to have some sleep now to be able to wake before 8 am! Because the train is moving all the time through Russian time zones, there is only 23 hours in a day! PS. Also have a look at our Voice blogs from the trip through Talky.se service and photos from Flickr. Strastuits! We’ve arrived to Moscow 8:25 local time! The trip was quite an experience already. Tight 4-person cabins in the Tolstoy train made it feel like we were in Russia all the time even though half the route was in Finland. We are having around 4 hour stop in Moscow now, people go to eat lunch and have some snacks and drinks to the next part of the journey. 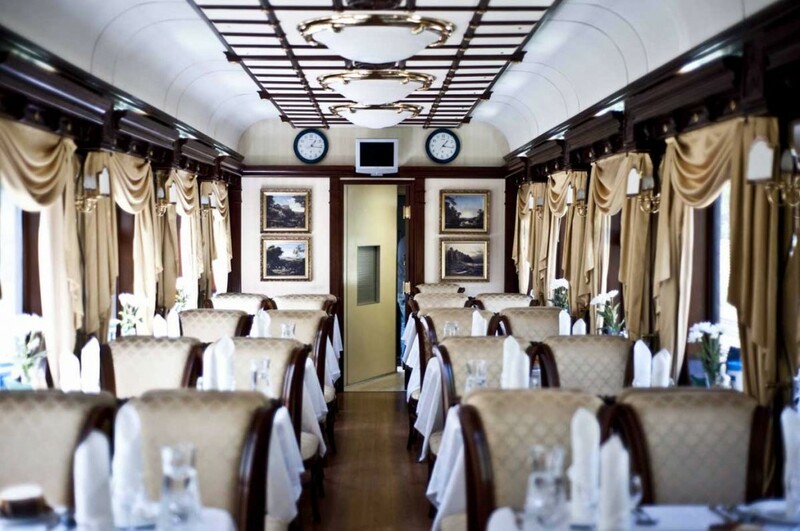 On 12:50 our private train departs from Kazan station. There are 4 sleeping cars, a conference car, restaurant car, shower car and personnel car in our private train. The next longer stop is in Ulan Bator, the capital city of Mongolia. So it’s 5 days in a row on the train now, and the activities are really starting. We have lots of company and university workshops and activities organized during our journey in Siberia. On Friday 14th of May Aalto on Tracks finally becomes true as we pack our bags and jump on board to the Tolstoy train that will take us to great adventures. Before we leave, Aalto on Tracks together with Aava and AYY would like to say goodbye to us in Amarillo where the Farewell party is arranged. This is a great opportunity to meet all the participants and wish for a memorable trip. Maybe a glass of wine will make the departure easier or a glass of sparkling wine will make it more festive? Please bring your friends, sisters & brothers, lovers and moms with you to wish us all good luck to our journey: the farewell party is open for everyone! Around 17:00 we will together go from Amarillo to the railway station so everyone will be there on time. The Tolstoy train will depart on 18:23. Sign-up on Facebook. Hope to see you all there! Aalto on Tracks kindly thanks every partner company, who is making our trip possible. We are working on cases and innovations for the partner companies on the train with multi-disciplinary teams. Some of our partner companies are also happy to host us a company visit in Shanghai. For Nokia, we are using Nokia Ovi as a platform for social media. 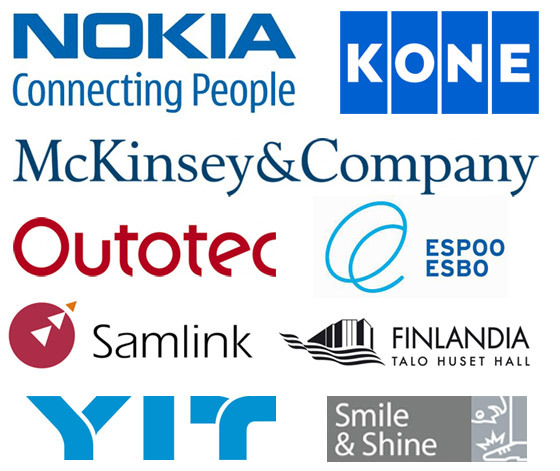 Thanks also for our sponsors for the support: HiQ, Ramboll, Konecranes, Tieto, Microsoft DreamPark & BizSpark, Teknoware, Saint-Gobain Isover, Academic Work, UPM-Kymmene, Seedi, Napa. See the partners page for full details. PS. 4 days before departure! Our departure from Helsinki is on 14th May 18:23 with a Tolstoy train! We have now confirmed the participants on Aalto on Tracks! Thanks for the great applications and enthusiastic ideas. It was great to see powerpoint presentations, hand-drawn pictures and even videos as free-form applications! You can have a look at the Participants page. Lot of stuff have happened during last few week. We have already many groups working on different programs on the train, like TEDx, company case team, publication team, sports team, culture team etc! In addition to the program arranged by the participants, we will also have eReader research case, workshop cases from Espoo city (social media and online services), company workshop cases and lot more. We have confirmed around 15 company partnerships for the project. We will publish the sponsors this week. We will stay one night in Beijing as well. We are honoured to have co-operation with the students of the best university in China, Tsinghua University. We will have program with BATES (Business Association of Tsinghua Entreprenerial Students), which is a student-run entrepreneur club just like Aaltoes. In Shanghai we will have many company visits, different kinds of excursions, the opening of Aalto-Tongji Design Factory Shanghai and of course participate to Finland Day in the expo and all the events there. Check out the general Shanghai program from Aalto University web page as well. PS. our train leaves on 14th at 18:23 from Helsinki. We will have farewell party in Amarillo (Mikonkatu 9) near Helsinki railway station just before the departure, starting from 3 pm. It will be open for everybody, come to wish good journey for us! We have selected around 80% of the participants and we had application more than places. We have people confirmed from Aalto University School of Art and Design, School of Economics, School of Science and Technology + University of Helsinki, Sibelius Academy, Tampere University of Technology and TU Ilmenau Germany – it’s going to be very multidisciplinary experience! Remember that we have arranged the possibility to do the exams on the train. PS. today on Wednesday 14th is Planning Event for all the participants, 18:00 at Design Factory.